← IHBC welcomes top lawyer double act to the 2019 Annual School, with Charles Mynors and Nigel Hewitson: ‘… on legal issues around conservation calamities’! Kate Kendall the IHBC’s LETS Officer has continued her travels across the UK, delivering IHBC accreditation application guidance and CPD to members and colleagues, most recently with her Membership Application Training Event (MATE) session at Historic Environment Scotland (HES) in Edinburgh on 7 February. 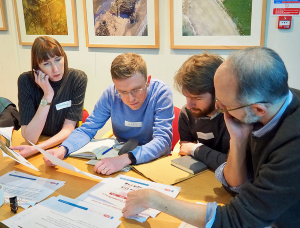 Fiona Newton said: ‘The attendance at the HES MATE session demonstrated how people from a wide variety of professional backgrounds are united by their skills in conservation and their interest in gaining recognition for those skills from the IHBC’. If you would like to arrange a session or attend a Branch session please contact Kate Kendall lets@ihbc.org.uk. For information there are sessions in Manchester on the 28th February, York on the 30th March and London 15th May. To book or enquire get in touch with Kate.